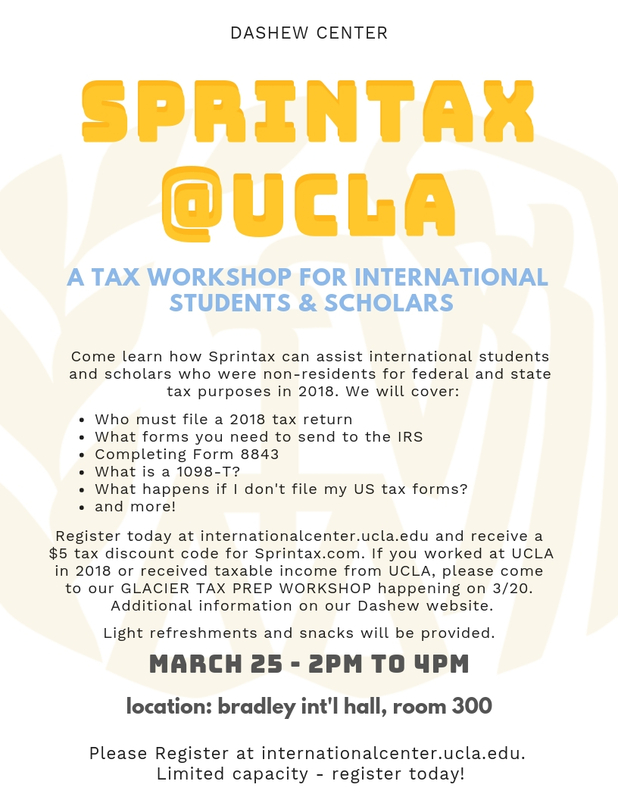 Dear international students and scholars, tax season is here! Come learn about filing your taxes, who must file, what forms to complete, and more. Taxes for the calendar year (i.e. Jan 01, 2018 – December 31, 2018) must be reported by April 15, 2019. Tax forms are filed with both the US Government (federal) through the Internal Revenue Service (IRS) and the US state(s) in which income was earned. Students and Scholars who are considered non-residents for federal and state tax purposes must file taxes if they earned income in the 2018 calendar year. If you didn’t receive any taxable income, you are still required to file a Form 8843. For additional information, please visit the Dashew Center’s Tax Resource Page. *Click on the flyers below to register for the workshops down below to learn more information about filing your taxes by the deadline. Are you a student or scholar that received income from UCLA in 2018? Did you hold employment with UCLA in 2018? 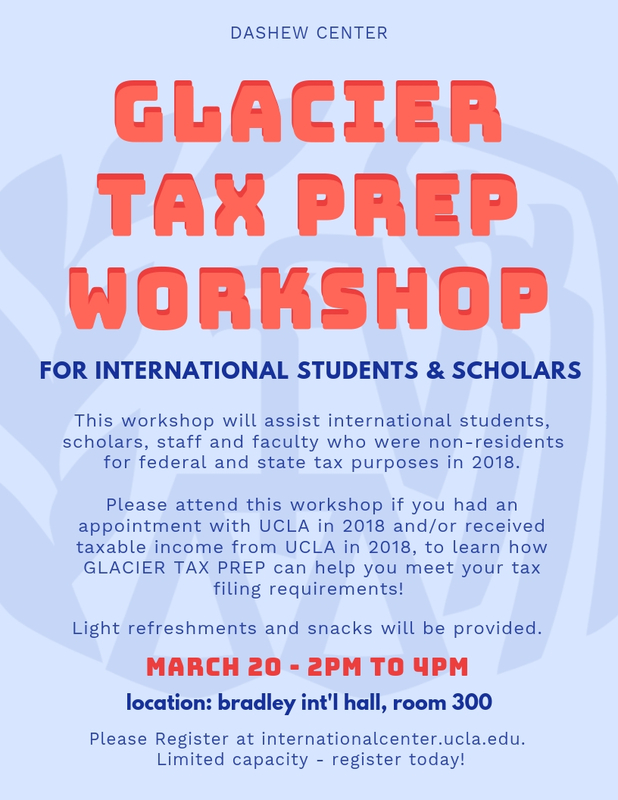 This GLACIER TAX PREP Workshop is for YOU! Come learn how GLACIER TAX PREP can help you complete your tax filing requisites! Did you receive income in 2018? In need of filing of your federal and/or state tax forms? You don’t want to miss out on this workshop! Come learn how Sprintax can help YOU file your tax forms, including Form 8843. Visit the registration page for this workshop to receive a $5 federal discount code you may use on Sprintax.com! Important Note: DCISS is not permitted to assist with any IRS tax form preparation or tax related questions. Any questions or concerns should be directed to a certified tax preparer at either one of our workshops or a local IRS field office. 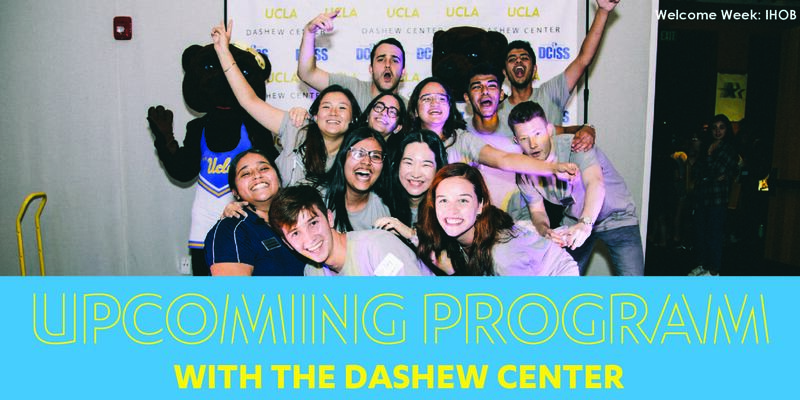 Copyright © 2019 UCLA DASHEW CENTER, All rights reserved.